Taglines: Real power can't be given. It must be taken. According to Peter Biskind's book "The Godfather Companion," a 1985 script co-written by Thomas Lee Wright and Nick Marino, included a character based on drug lord Leroy 'Nicky' Barnes. When the script was briefly considered, Wright persuaded Eddie Murphy to take the role. Murphy reportedly said, "I would act in The Godfather for nothing." Continuity: A hand can be seen on the shotgun on the table in the opera, followed by a shot of the hand reaching down to pick it up. Many believed that the series was complete in 1974. Even Francis Ford Coppola thought that another installment was unlikely. However in 1990, some 16 years later, "The Godfather, Part III" was released with results that few could have perceived. The film was not very successful at the box office and many who did see the movie said "ho-hum". The critics were also indifferent to an extent. A Christmas release would create enough steam for the film to achieve a best picture nomination and seven nominations in all from the Academy (it failed to win any though). Of course "Dances With Wolves" dominated the night and that film along with "GoodFellas" are considered the class acts of that year. Why has "The Godfather, Part III" failed to achieve a following like its two predecessors (parts I & II)? I am not sure I can answer that question. Michael Corleone (Al Pacino) is becoming an old man and his health is slowly worsening. He wants the family to become 100% legitimate and even makes a deal to link his finances to the Vatican. However Michael has become a bit naive and everyone double-crosses him. Now it appears that the only answer is to get back to the old ways. Younger sister Connie (Talia Shire) believes that Michael has grown soft and that Santino's (James Caan from the first film) illegitimate son should take control (Andy Garcia, in his Oscar-nominated performanece). He is ambitious and has the short fuse that his late father had and this is going to lead to fireworks for the family. He also starts seeing Michael's teenaged daughter (Sofia Coppola, Francis Ford's real-life daughter) and a romance blossoms. Meanwhile crime bosses Eli Wallach and Joe Mantegna pose threats to the Corleones. Kaye (Diane Keaton) has divorced herself from Michael and their son (Franc D'Ambrosio) has somewhat sided with her. Michael's health takes a turn for the worse as he actually goes into a diabetic coma for a time during the film and when he does recover (not completely though) he starts to reflect on a life of loss. The ordering of Fredo's death (John Cazale) in the second installment and his Sicilian wife's murder in the original haunt Michael and he tries to come to terms with his life, but learns from a Catholic cardinal while in Sicily that he deserves all the suffering he experiences and realizes that his suffering will be even greater in the future. In fact there will be a finale that will be the "fatal nail in the coffin" for Michael. 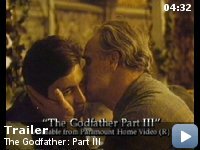 "The Godfather, Part III" is focused on Michael and that is why it is unique to the series. The first two sported so many rich characters that it was impossible to focus on just one. This film could be best described as "Reflections of a Life of Loss". The film is excellent and even though it is likely the weakest of the three when you compare them, it is somewhat unfair to put the three "Godfather" movies together because they can all stand on their own. Great movies stand on their own and "The Godfather, Part III" does just that. 5 stars out of 5.